Urgent health warnings have been issued as Britain experiences its hottest day in nine years. Temperatures have hit 34.5C (94.1F) at Northolt in west London and could hit 35C (95F), while most of Britain will see the mercury hover between 30C (86F) and 33C (91.4C). Young children, the elderly and those with serious illnesses are at particular risk amid fears the hot weather could lead to hospitalisations and even deaths. Wimbledon is braced for what could be the hottest day in its history, which may see its controversial new heat rule triggered which allows women, but not men, to take 10-minute breaks if a certain temperature is reached. On the transport network, speed restrictions have been imposed by Network Rail on some train lines amid fears the metal tracks could buckle under the searing heat. While motoring group AA warned that roads could melt, bringing disruption to motorists. 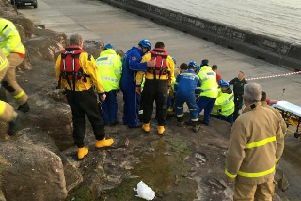 Fresh warnings about the dangers of outdoor swimming in the heat have been issued after a man’s body was recovered from a reservoir. The man was found at Alton Water reservoir in Tattingstone, Suffolk, at about 8pm yesterday. Parts of the UK will be hotter than Barcelona and Athens today. Bottled water has been handed out to lorry drivers stuck in the heart in huge tailbacks on the M20 in Kent, caused by striking ferry workers who have closed the Port of Calais. Water has also been handed out to passengers at Greater Anglia stations including Ipswich and Norwich as health experts urged people to keep hydrated. A spokeswoman for Network Rail said metal rail tracks could get 20C (68F) hotter than the air temperature, meaning they could reach 55C (131F) prompting fears the steel could expand and buckle. She said they were monitoring track temperatures and speed restrictions were in place across a number of lines. One train operator advised passengers to avoid travelling between 1pm and 7pm, while employers have been urged to allow staff to travel outside rush hour to avoid hot, overcrowded public transport. Public Health England has warned people to try to keep out of the sun between 11am and 3pm, and have called on the public to look out for the elderly, young children and those with serious illnesses. Independent Age, a charity representing older people, called on the public to check on their elderly neighbours. Janet Morrison, the charity’s chief executive, said: “Older people can suffer adverse effects on their health during the hot weather and can be more vulnerable to illnesses such as heatstroke, heat exhaustion and dehydration. “We would encourage the elderly to keep hydrated and as cool as possible, keeping out of the heat and sun. Greater Anglia Trains has implemented speed restrictions on services between London Liverpool Street and Shenfield and Southend Victoria, and cancelled a number of peak-time trains this evening. Southeastern is also restricting the speed of trains and warned passengers to avoid travelling between 1pm and 7pm. It is expected to be the hottest day since July 19 2006, when the temperature hit 36.5C (98F) in Wisley, Surrey. He added: “We would advise people to take care in the heat, especially if you are out at Wimbledon all day. Edmund King, AA president, said on Twitter: “Some road surfaces can melt at 50C so if weather hits 30s the ground temp in direct sun can hit 50. And motoring group RAC said the number of accidents surged by 92% in the hot weather yesterday. Bookmakers Coral have slashed the odds on it being Britain’s hottest ever summer from 4-1 to 3-1. They said chances a hosepipe ban will be introduced somewhere in the UK is an odds-on favourite at 1-3. And Coral said it is odds-on at 10-11 that Wimbledon will be the hottest tournament in its history, beating the previous record of 35.6C (96F) in 1976.